HOLLYWOOD BEACH, Florida - Beachgoers experienced a few moments of terror when sharks began to approach swimmers in the shallow ocean water off of Hollywood Beach, Florida last week. At least two sharks, which appear to be blacktip sharks that are migrating in the thousands off of South Florida this time of year, were seen swimming parallel to shore as frightened swimmers frantically tried to get out of the water. 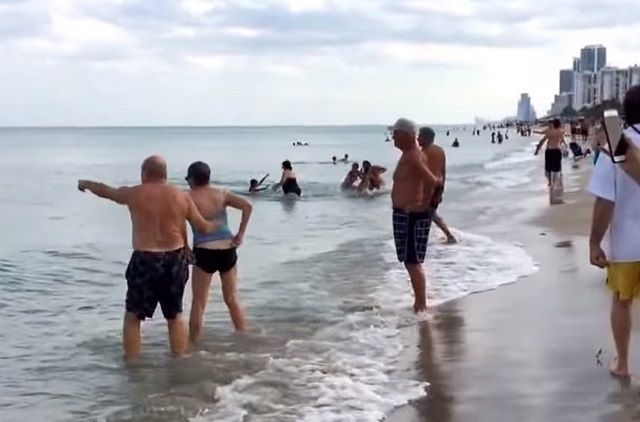 In the video, parents can be seen rushing into the water to save their their children from the apex predators as onlookers point and yell, "Shark!" According to the Daily Mail, the sharks were just yards away from an elderly couple enjoying the warm Florida water on March 4, 2016. Blacktip sharks (Carcharhinus limbatus) are the number one species for biting people along the beaches on the U.S. East Coast. The shark has black tips on its pectoral fins and can grow to be around six feet in length. According to the International Shark Attack File, blacktip sharks are responsible for around 16% of shark attacks in Florida. Blacktip sharks prefer water less than 100 feet deep and can swim into water just inches deep.